Me and D: Look How Far I've Come! Look How Far I've Come! Two years ago today, I wrote my very first post. With lots of encouragement from Kim and C, I took the plunge and put myself out there. The community I found through twitter and this blog has truly changed my life. The Diabetes Online Community has saved me from myself. Two years ago, I binge ate practically every day. My blood sugars were primarily in the 200s and 300s. I was completely burned out, apathetic, and felt completely alone. Look how far I've come! And it's thanks to all of you. Thank you for sharing your stories, for being so supportive and encouraging, and for carrying me when I didn't have the strength to stand on my own. January: "I love the Diabetes Online Community." February: "You may have noticed I've been rather quiet lately." March: "There is something magical about having this space, this little corner of the internet, to share my thoughts and feelings." April: "Way more happened at the Medtronic Diabetes Advocates Forum than I can possibly describe myself." May: "To me, if you live with diabetes or love someone who has diabetes of any kind, you are a hero." June: "I don't even know where to start." 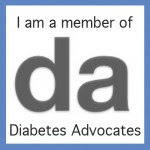 July: "There are a lot of reasons I LOVE the Diabetes Online Community." August: "Nineteen years ago yesterday, I was diagnosed with Type 1 Diabetes." October: "TCOYD. YCDT. Some acronyms from a few weeks ago." November: "I'm almost afraid to say anything." December: "Back before Thanksgiving, I made a trip to the endocrinologist." Congrats and keep 'em coming! Your words are always appreciated. CONGRATS & we are so lucky to have you!!!!!! It's only been two years?? I feel like you've been around for at least four or five! Wow! So glad you joined us. It's been great hanging out, online and off! Congratulations on what sounds like two fantastic years. And please don't stop. You're making a difference for yourself and others. Yay, happy blogaversary!!!! Thank you for all of the help you've given me over the past two years! So glad you're here, Jess. You add a lot of value through your brave and honest posts. Thank you! Wow! Hard to believe it's only been 2 years, Jess...!!! So glad to know you and have you sharing your story in this great community. Congrats on how far you've come, and can't wait to see what's in store for 2013 and beyond! Jess, your blog is a source of strength for me. Thanks for writing.